Forget “50 is the new 40” or even “the new 30.” Age 50 is about moving forward. That’s why the YMCA and Pfizer Inc launched 50 MOVING FORWARD, a healthy living plan designed to motivate adults 50 years and older with fresh ideas around behaviors that experts say are crucial to healthy aging: physical activity; preventive measures like screenings and vaccinations; healthy eating; and social interaction. Those who want practical information, tips and activities that will help them build a healthier future can enroll for free starting today through May 18th in person at any YMCA location or online at YMCA.net/50MovingForward. Adults 50 years and older currently make up more than 30 percent of the US population, and by 2015, they are expected to represent 45 percent of Americans. The Centers for Disease Control and Prevention (CDC) suggests that adults 50 and older have a 70 percent chance of developing at least one chronic disease. That’s why the Y, one of the nation’s leading nonprofits dedicated to improving the nation’s health, teamed up with Pfizer, with its health care expertise, to develop 50 MOVING FORWARD. Together, they are working with older adults to help them address their health and well-being. 50 MOVING FORWARD goes beyond the basic tenets of healthy eating and physical activity and highlights the importance of helping prevent health problems before they arise through screenings and vaccinations, and the health benefits of staying socially active and connected. One of the most beneficial things people can do is take steps to prevent illness. Even those who already practice healthy habits should be aware of things that may affect their health because as people age, their immune systems naturally begin to weaken. While it’s important to eat well and be active, 50 MOVING FORWARD urges individuals to talk with their health care provider about getting regular health screenings and keeping vaccinations current. Every year, hundreds of thousands of American adults are hospitalized from diseases such as influenza, shingles and pneumococcus that could have been prevented by vaccination. YMCA of the USA (Y-USA), the national resource office for the nation’s 2700 YMCAs, selected the YMCA of Western North Carolina to participate in its Racial and Ethnic Approaches to Community Health (REACH) initiative. The goal of REACH is to improve health and eliminate disparities related to chronic diseases in African American/Black and Hispanic/Latino communities. In October, 2012, the Centers for Disease Control and Prevention’s (CDC) REACH initiative awarded Y-USA a cooperative agreement of up to $4 million per year for up to five years to improve our nation’s health and well-being, with a specific focus on addressing gaps between racial and ethnic groups across the country. Y-USA is re-awarding this grant, selecting up to 16 new communities per year to participate in the REACH initiative in their communities. The Ys receiving funding are serving communities that reflect populations of under 500,000 and have an established relationship with a geographic area that is at least 50 percent African American/Black or Hispanic/Latino or a combination of the both racial/ethnic groups. Being selected for the REACH program will allow the YMCA of Western North Carolina to address barriers to healthy living in its community. "As a leading nonprofit committed to healthy living, the Y believes that everyone in our community deserves to live life to its fullest regardless of where they live or the color of their skin," said Paul Vest, CEO. "The Racial and Ethnic Approaches to Community Health funding helps ensure our programs and initiatives are helping those individuals who face the greatest barriers to healthy living." Many preventable risk factors—tobacco use, poor nutrition and lack of physical activity—are more common in communities of color, often resulting in higher prevalence of chronic diseases, such as heart disease, stroke, diabetes, cancer and asthma, among others. Chronic disease contributes to roughly 75 percent of the $2.5 trillion spent annually on health care in the United States. "Where you live should not affect your health," said Neil Nicoll, President and CEO, YMCA of the USA. "Yet, too many communities lack the resources for individuals to access opportunities for physical activity and healthy foods and improve their health and well-being. The Y’s longstanding partnership with CDC has allowed us to strengthen communities through programs and initiatives that create environments where all people have the opportunity to make a healthy choice. These funds enable us to continue this work and expand it to communities that need it most." The YMCA of Western North Carolina is one of 16 Ys selected to receive funds through REACH. Several other national organizations will work with Y-USA to help achieve the goals of the cooperative agreement. Partners include the American Psychological Association, National Association for the Advancement of Colored People, National Council of La Raza and California State University at Long Beach Center for Latino Community Health. All of the organizations funded through the REACH program bring the resources, dedication, and experience as leaders in this effort to create health equity across the country. To learn more about the Racial and Ethnic Approaches to Community Health program, including previous funded programs, visit www.cdc.gov/reach. The DRAFT North Carolina Statewide Pedestrian and Bicycle Plan (WalkBikeNC Plan) has been released for public input. Public input is very important. Please go to www.walkbikenc.com to access links to the Draft Plan products. Imagine a community where kids can walk or bike safely to school; where a family can take an evening stroll; where an individual can make a quick trip to the grocery store without getting in the car. Efforts are being made create a blueprint for improving walking and bicycling for North Carolina communities. * Promote physical, mental and social well-being by providing outdoor places to relax, exercise and socialize. * Provide easy walking or bicycling connections between neighborhoods, schools, parks and trails. * Increase property values, promote tourism and foster local businesses by encouraging foot traffic. * Improve overall quality of life. Other benefits include reduced traffic congestion, fewer vehicle crashes and improved air quality. State agencies also benefit from less wear on roads, which leads to lower costs and more efficient use of our transportation network. What kind of walking or bicycling opportunities would you like to see in your area? How can we best provide the facilities to benefit the health, safety and well-being of your family and community? With your help, we can work to meet the needs of communities to allow people the freedom to safely walk or bicycle to work, school or just for fun. On Thursday, April 11th, Sarah Susanka, acclaimed architect and best-selling author of the Not So Big book series will present The Not So Big Community to benefit Asheville Area Habitat for Humanity's Building a Way Home campaign. Lead sponsor The Hilton at Biltmore Park, Asheville is the venue for this special event. With more than 1.2 million copies of her books sold, Susanka has helped readers understand how walkable communities, “better, not bigger” design, and well-thought-out neighborhoods can positively impact our overall well-being. 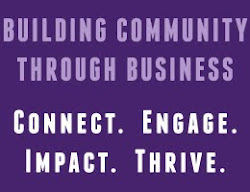 On April 11th, Susanka will discuss how we can incorporate changes into our lives that, collectively, will lead us towards creating more dynamic and sustainable communities. According to Susanka, the more engaged and present people are in the process of making a community, the more alive an sustainable it will be. Learn how Asheville Area Habitat for Humanity is building communities like this as part of its Building a Way Home campaign. Note: A small block of rooms is reserved for event guests at a special rate. Mention this event when booking. COST: Ticket $65. To purchase, visit ashevillehabitat.org or call Eva Mellert at 828.210.9385. Sponsorship opportunities available, starting at just $250. Contact Eva for details.